It’s a Grand Slam All-Star Party! 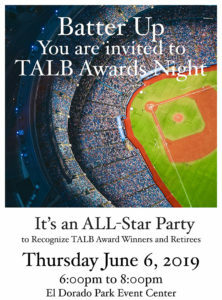 TALB’s annual Awards Night is a great tradition where we celebrate all of our educators. We will honor our retirees and recognize outstanding achievement. All TALB members, supporters and guests are invited to join in. Seating is limited so don’t delay in purchasing your ticket. HONORED RETIREES: PLEASE COMPLETE OUR RETIREE INFO FORM SO THAT WE MAY HONOR YOU AT AWARDS NIGHT WITH A BOUQUET OF FLOWERS AND RECOGNITION IN THE PROGRAM. CLICK HERE TO COMPLETE YOUR FORM. Tickets Prices and Discount Promo Codes. The base ticket price for non-members is $30. TALB Members and others listed below will use Discount Promo Codes listed below to reduce the cost of their tickets. Registering for Non-Member Guests should just be registered as a “Non-Member Guest” without any promotional code. Please do not use promo codes for your guests.